LATOKEN (LA) is a cryptocurrency token generated on the Ethereum blockchain. The total supply of LATOKEN that will ever be issued is 400.00 Million tokens, and the current supply of LA in circulation is 344.60 Million tokens. Current LATOKEN price is $ 0.0926 moved down to -9.71% for the last 24 hours. All time high (ATH) price of LATOKEN reached $ 0.263 on 5th May 2018 and fallen -64.8% from it. LATOKEN's share of the entire cryptocurrency market is 0.02% with the market capitalization of $ 31.92 Million. LATOKEN’s 24 trading volume is $ 2.32 Million. It is trading on 8 markets and 5 Exchanges . Find more details about LATOKEN cryptocurrency at the official website and on the block explorer. LATOKEN price Index provides the latest LA price in US Dollars, BTC and ETH using an average from the world's leading crypto exchanges. The LATOKEN to USD chart is designed for users to instantly see the changes that occur on the market and predicts what will come next. LATOKEN is a universal multi-asset trading platform. It is aiming to become a leader in the cryptocurrency trading market. To achieve this goal, LATOKEN is building a decentralized exchange that allows huge trading volumes of up to 100 000 TPS. This platform already allows trading of major crypto pairs and some ICO tokens. Now they are working on acquiring all the necessary licenses to launch full-scale trading. Newsfeed and advanced trading features. LA is the main currency at LATOKEN platform. It gives users an ability to trade crypto and asset tokens with a discount in trading fees compared to other cryptocurrencies. 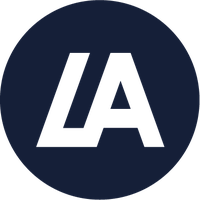 LA is an utility token which has been confirmed in a legal memorandum. The token is already listed on several exchanges, including OKEX, HitBTC and KuCoin. 400 million tokens were issued during LA`s token sale, and 78 million were distributed. LATOKEN value chart is available on this page.